The waiting is almost over and the dream is ready to be fulfilled. Pinch yourself and pinch yourself again because it's true - we are on our way to Wembley at 8:30am tomorrow morning and just before 2:15pm we'll be welcoming our heroes onto the sacred turf for the FA Trophy Final against Stevenage Borough. With a possible sell-out crowd cheering from all around the brand new Wembley Stadium it will be a vision of wall to wall Red & White and hopefully a game to remember. Just so long as it is more memorable for us. It seems a long time since we entertained an unknown Vauxhall Motors in a heart stopping draw at Aggborough just before Christmas last year. A 3-1 lead was squandered as Vauxhall drew level midway through the first half and then after Luke Reynolds added what should have been the winning fourth goal we sat back and allowed the Motormen a last minute equaliser. After a cancellation of the midweek replay due to Cheshire fog we eventually trooped up to Merseyside and watched as James Constable cracked in a hat trick in a 4-0 win to put Vauxhall firmly in their place. By now we had learnt who our next opponents would be and so the following Saturday we all trooped down to the other end of the country for the 2nd round game at Exeter City. A super goal from Iyseden Christie (right) soon shut the crowing City fans up. After easily beating one of the better sides in the competition you knew what was going to happen against Braintree Town from the Conference South. We struggled!! A scoreless draw at Aggborough meant another midweek trip to the back of beyond and this time it took a late whirlwind of brilliance from us to score three times in as many minutes after being a goal down since early in the first half. Halifax were disposed of easily enough in the quarter finals with a 3-1 scoreline in our favour to take us into the semi finals against Northwich Victoria. After winning the first leg at home with goals from Gavin Hurren (left) and James Constable we thought we were all set up nicely for the away leg at Northwich the following weekend. How wrong we were. In front of a massive away support of over a thousand we thought it would be a formality but Northwich had different ideas and after we had dominated the opening period they suddenly struck with two goals in three minutes to bring the tie level to two apiece. 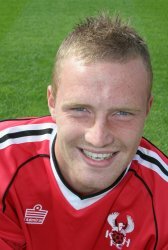 We reclaimed the initiative fifteen minutes later when Mark Creighton (below) scored his first ever goal to give us back the lead and Russell Penn increased it further midway through the second half. Of course there's always one idiot and it's usually the referee. This one awarded the Vics a penalty in the dying seconds of the game after one of their own players handled the ball without a Harriers player in sight. Luckily it didn't stop the Harriers fans swarming onto the pitch to celebrate our achievement with the players and the Chairman, Barry Norgrove. Let's not forget Stevenage in all this back slapping and look at how they have got this far. Their opening Trophy game was at home to Merthyr Tydfil and boy did they go to town. Running out 7-0 winners with four goals from George Boyd and one apiece from Steve Morison, Steve Guppy and Craig Dobson they certainly started their 'Road to Wembley' with a corker. Their next game was also at home and this time Leigh RMI were despatched with ease in a low scoring game. 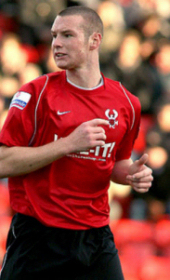 Three goals from Jamie Slabber and Steve Morison (2) and just the one in reply gave them a tougher game at Morecambe. They didn't do quite as well as we did in Devon but still overturned the form book to take them back to Hertfordshire for a replay that they obviously won. If they hadn't they wouldn't be going to Wembley tomorrow. This time three goals were enough to see the play-off finalists off and Morison, Jon Nurse and Adam Miller saw to that. Another three goals were racked up in the next game at home to Salisbury City and then they entered into the semi finals with games against former winners Grays Athletic. With Grays hoping to make it three Trophy wins in a row it was always going to be tough call to decide a winner but Borough did well again and won both the games with a 3-1 aggregate and their eyes were now firmly set on Wembley too. We all know we'll be without Jonny Harkness for this important game and we all know how much the lad regrets what happened. He was, and still is, obviously gutted by being cruelly sent off against Grays but he'll still be at Wembley with his family to cheer his mates on. There are, or better not be, any injuries so every other player will be vying for a place in the starting line-up. 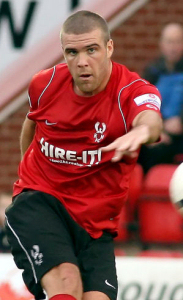 That should also include Andy White now that he's returned from being out on loan at Stafford. Stevenage will also have a full squad to choose from and will be hoping that Steve Morison can add to his scoring record in the Trophy. He's scored seven times so far for his team but so has James Constable (right) for us. With both players on seven goals the player that scores the most goals in the big game will be rewarded with a pair of tickets for the UEFA Cup Final between Seville and Espanyol. This will be played at Hampden Park on May 16th and the top scorer will also be awarded an inscribed silver salver to commemorate their feat. With James going through a barren spell at the moment the prize could well end up in the Stevenage mans hands but our man is long overdue for a goal and with the recent brief break from football could well have his shooting boots back on. It's just a matter of being in the right place and Constable is good at that. Another player looking forward to the game will be Iyseden Christie. 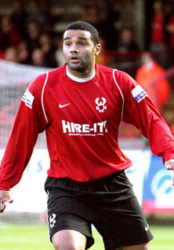 He has missed out on previous chances to play at Wembley when he was with Orient and Mansfield but that was down to being injured both times. Now that he's fully fit he's guaranteed a place in the team and he must be our first choice striker along side Constable. He's also on a lean spell at the moment and is overdue a goal. Again, he's got just a good a chance to score as any other player. It's going to be a great day out for us all tomorrow, both Harriers and Stevenage fans. With other fans from other clubs all wanting to be part of it all it's going to be an occasion to remember. Let's just hope that it's the Harriers who remember it the most. Bevan, S Taylor, Kenna, Creighton, Whitehead, McGrath, Sedgemore, Hurren, Russell, Penn, Reynolds, Blackwood, Smikle, Christie, Constable, Hay, White, Eaton. Julian, Potter, S Lewis, Fuller, Nutter, Oliver, Batt, Gaia, Hakim, Slabber, Nurse, Miller, Mackie, Hatton, I Lewis, Morison, Guppy, Dobson, Binns, McMahon, Henry, Beard, Deen, Hughes, Sealey, Bradshaw.